You can apply “the Ken Burns effect” to any video in iMovie. This effect makes it appear as if the camera is sweeping across (panning) the video or drawing nearer or farther away (zooming). When you apply the effect, you can set where the sweeping motion starts and ends, and set whether the motion zooms in or out. 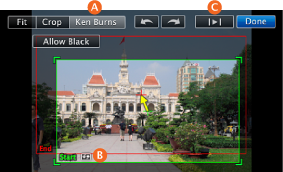 In the Project browser or Event browser, select a video clip that you want to apply the Ken Burns effect to, and then press the C key or click the Crop button, shown below. In the viewer, click the Ken Burns button (A, below). A green rectangle (which shows the portion of the image that’s showing when the effect starts) and a red rectangle (which shows the portion showing when the effect ends) appear over the image. Clicking the double arrow button (B, below) causes the Start and End rectangles to swap locations. Drag to resize and reposition the green rectangle over the portion of the image where the Ken Burns effect starts. Drag to resize and reposition the red rectangle over the portion of the image where the Ken Burns effect ends. To preview your work, click the Play button (C, above) in the viewer. When you’re satisfied with the effect, click Done. You can change or remove the Ken Burns effect at any time. Go to this topic to learn how: Edit or revert cropping, rotating, or the Ken Burns effect.